And Then There Were None meets The Hunger Games. Ten trekkers meet for the first time at a campfire on mountainous Corsica. Their task: complete Europe’s most challenging hiking route, the GR20, in two weeks. The competitors have been hand-picked from among thousands of applicants by Mr North, a mysterious figure who made his fortune in gaming. The million-euro prize will be divided equally among those who make it to the finish line alive. A relaxed ramble quickly turns into a desperate battle for survival, as inexplicable deaths start to mount on the trail. The competitors know the smaller the group gets, the bigger the pot at the end grows. On top of that, they have also angered the hot-blooded islanders – and vendetta is Corsican for blood vengeance. 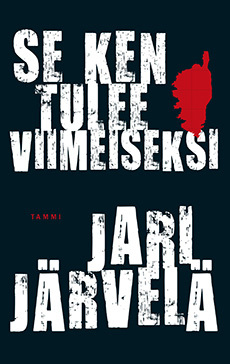 Jari Järvelä (b. 1966) writes novels, radio plays, librettos, and travel stories. He has a three-stripe brown belt in karate and lives between sea and stream in southern Finland. On holiday he finds himself seeking out higher altitudes: most recently Järvelä followed the footsteps of the Incas in the Andes.